**CURRENTLY OFFLINE** - The consensus best animation of 2018 in Cartoon Brew's programmer poll, a startling, experimental vision of cosmic degeneration. As celestial beings descend to Earth, the world’s order unbalances. Initiated by these terms, a tragic fall leads to the parturition of crucial opposites: Hell and Heaven’s circles. It’s an overused bit of hyperbole to claim that a short film is “an experience”. Apologies if I’ve trotted out this bit of wordplay before, it should really be reserved for work like Boris Labbé’s La Chute. Massive in scope, both formally and thematically, this 15min cycle of divine terror has recognizable referents in other mediums: in literature, Dante’s Divine Comedy, in art, the work of Bosch and Bruegel, and yet transported to motion it is wholly unique and utterly engrossing. Playing on an ontological scale more akin to an apocalyptic blockbuster than an indie animation, the film’s combination of meticulous craft, spare, unnerving score, and cosmic horror, is very nearly overwhelming to the senses. Before you genre fans get too excited, the film is certainly experimental—there are no protagonists to root for, and while there are plenty of big bad monsters I suppose, they aren’t shriek-inducing. 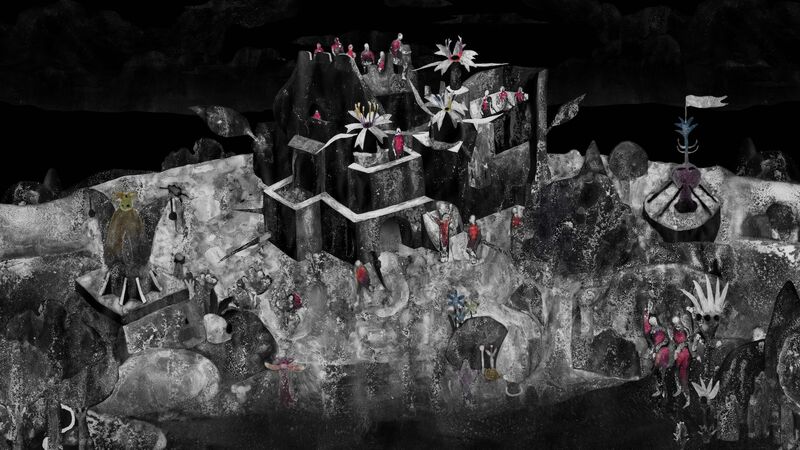 Labbé, continuing in a style that has allowed his career to shift seamlessly between the worlds of fine art exhibition and independent animation, eschews conventional storytelling to tell a narrative of biblical proportions as both a macro-level epic of the formation of heaven and hell, and a multitude of micro-depictions of individual chaos, torture, and suffering. This is reflected in the art of the film itself; utilizing a massive canvas, Labbé reaches back to the highly detailed paintings of renaissance masters like Bruegel and Bosch, with a dash of the surrealist horror of Francis Bacon or Goya, and displays it all on screen. The sheer cacophony of motion is both startling and fresh, as it is something only possible in our modern age of digital compositing. Yet there is a tactile feel to it all as well, as the individual elements are the result of over 3500 hand-drawings in indian ink and watercolor, completed on roughly A3-sized paper. There are precious few cuts in the film, instead a roving virtual camera frequently pans the landscape, highlighting scenes embedded within the larger, organic whole. The screens at our disposal feel inadequate to the scale, and one longs to see the piece as a proper gallery installation, to be inspected at will, and immersed in the haunting music provided by frequent Labbé collaborator Daniele Ghisi. The immensity of the achievement as been duly recognized with a shelf full of awards from the most prestigious animation festivals in the world: Ottawa, Annecy, and Zagreb included. In advance of awards season, Cartoon Brew polled a who’s who of animation festival programmers (including S/W curator Jeanette Bonds) on the best shorts of 2018, and La Chute took the top spot. While shut out of Oscar with the announcement of The Academy’s Shortlists last month, the film is still in the running for France’s top honor, the César, and in the run-up to that the production company behind the film, venerable Paris studio Sacrebleu (they previously produced Labbé’s Rhizome), has made the film available to online audiences for a limited time. We’ve had our eye on Labbé for several years now. A graduate of the French animation school EMCA, his acclaimed student work Kyrielle was one of my favorite pieces to display in event settings while I was at Vimeo. He has now ascended to the top of the independent animation world, and it’ll be interesting to see where his artistic muse takes him next. An interview with the site ecran noir suggests that, unlike other luminaries in the short animation sphere, a feature is not in the cards, and nor should it be in our opinion. Labbé seems well-situated within the European animation space, and hopefully the immense praise for La Chute will allow him to continue experiment to his heart’s content outside capitalist pressures. In July Labbé traveled out to Japan for a residency at Tenjinyama Art Studio in Sapporo, and reportedly his newest work will focus on the Ainu, an indigenous minority in the north of the country.